The next film inline for a 3D conversion from Disney/Pixar was Monsters, Inc. It was released into theaters first back in December for a short run following the conversion from 2D to 3D. Generally Pixar's films have translated well into 3D, considering the source material, and this release is no exception to that rule. Monsters, Inc. is the story about the monsters that visit human children from their closets. Where do they come from? What do they want? All of those questions are answered in this film. The two main characters are Sulley (voiced by John Goodman) and Mike Wazowski (voiced by Billy Crystal). These two are a duo made in movie heaven, like Abbott and Costello. While not intentionally being a comedic duo, the chemistry between Goodman and Crystal is truly exceptional to make their characters shine. They are both monsters, with Sulley being the best scarer in the monster world, and Mike his trusty sidekick – who has to do the boring stuff like paperwork. You see, in the monster world, they need energy, and the only source of their energy is the screams of children. Which is why they have to scare them. But all is not well in their world – they are having an energy crisis of their own – because modern human children are harder and harder to scare. The movie goes through the motions of an ordinary day for the two, until something happens…something that has apparently never happened before. A child makes it across their barrier and into their own world. The story continues from that point at a breakneck pace, including several fast moving action scenes that would work well as a theme park attraction like a roller coaster. You will feel like you are riding along with them during the movie. Personally I'm surprised it hasn't yet as the only two attractions that have come out of this movie is a dark ride (slow moving) based on the whole story and an interactive show based on only the *ending* of the movie (or in other words, what happens after the movie is over). The ending is one that should leave you crying as the animation combined with John Goodman's single word is extremely emotionally powerful. Pixar doesn't stop with just the story. Monsters, Inc. is one of the most beautifully animated films – from various monsters and scenery, to the individual strands of fur on Sulley that move in the wind. Usually post-production 3D conversions are to be avoided due to their low quality, but while this video wasn't up to par compared to the first 3D conversions done by Pixar (occasionally you will see the artifacts where it seemed that some corners where cut, but it's not enough to bring down my grading of this film) but it still incredible. Only a few movies benefit from being redone in 3D, and this is one of them. The depth of field is amazing and the 3D "in-your-face" stunts are kept to a minimum but are effective when used. This is one of those must own films in 3D. But that's not all – unlike many other of Disney's 3D titles, this one actually has a decent number of bonus features. You get the Partysaurus Rex Toy Story Toons short, For the Birds short, outtakes and the company play…all in 3D. The combo pack is a wonderful value, because it includes the Blu-Ray 3D, the regular Blu-Ray, a bonus feature Blu-Ray disc, a DVD copy and a digital copy of the film. The 2D Blu-Rays include more special features, including Mike's New Car short, audio commentary, games and banished concepts. We'll be able to revisit Mike and Sulley this summer, with not a sequel, but rather a prequel that details their monster training in Monsters University. Based on the included preview, we're going to find out how the two became friends as they don't really seem to get along. It sounds promising. 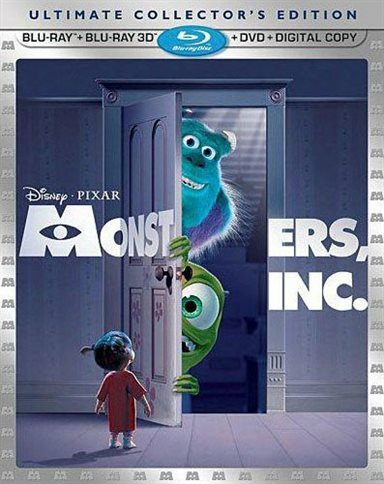 Download Monsters, Inc. 3D from the iTunes Store in Digial HD. For more information about Monsters, Inc. visit the FlickDirect Movie Database. Read More Reviews For Monsters, Inc.